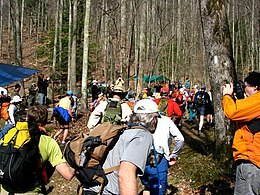 The Barkley Marathons is an ultramarathon trail race held in Frozen Head State Park near Wartburg, Tennessee. If runners complete 60 miles (97 km) this is known as a "fun run". The full course is 100 miles (160 km) (distances are approximate). The race is limited to a 60-hour period, and takes place in late March or early April of each year. Frozen Head State Park, Tennessee, U.S. 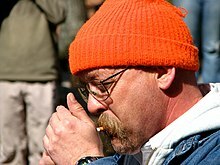 The Barkley course was designed by Gary "Lazarus Lake" Cantrell. His idea for the race was inspired upon hearing about the 1977 escape of James Earl Ray, the assassin of Martin Luther King Jr., from nearby Brushy Mountain State Penitentiary. Ray covered only 8 miles (13 km) after running 55 hours in the woods. Cantrell said to himself, "I could do at least 100 miles", mocking Ray's low mileage. Thus, the Barkley Marathons was born. Cantrell named the race for his longtime neighbor and running companion, Barry Barkley. It was first run in 1986. The Barkley is limited to 40 runners and usually fills up quickly the day registration opens. Requirements and times to submit an entry application are a closely guarded secret with no details advertised publicly. Potential entrants must complete an essay on "Why I Should be Allowed to Run in the Barkley", pay a $1.60 application fee, and complete other requirements subject to change. If accepted, an entrant receives a "letter of condolence". Upon arriving, new entrants (first time runners) are required to bring a license plate from their state/country as part of the entrance fee. Previous racers are required to mail in an additional "fee" which in the past has included things such as a white shirt, socks, or a flannel shirt, as a donation for being a non-finisher. Prior finishers of the marathon who return to run again must submit a pack of Camel cigarettes as part of the registration fee. Race bib number one is always given to the person deemed to be the least likely to finish one lap out of all who have applied; a "human sacrifice", as Cantrell calls it. The course itself, which has changed distance, route, and elevation many times since its inaugural run, currently consists of a 20-mile (32 km) unmarked loop with no aid stations except water at two points along the route. The loop begins and ends at the yellow road gate where the runners' and supporters' parked cars stay. Runners of the 100-mile version run this loop five times, taking a counterclockwise direction for loops three and four, followed by each runner alternating direction on loop five, after the first-placed runner's choice. The second and fourth loops are run at night, adding further difficulty to an almost impossible race. Runners of the 60-mile "fun run" complete three circuits of the loop. With 54,200 feet (16,500 m) of accumulated vertical climb, the 100-mile run is considered to be one of the most challenging ultramarathons held in the United States, if not the world. As of 2018, about 55% of the races had ended with no finishers. The 100-mile and 60-mile distances are nominal. While a nominal distance of 20 miles, which only covers the horizontal distance, the actual length of the loop varies due to changes in the elevations on the course. Some say the loop is as long as 26 miles (42 km), yielding 130 miles (210 km) for the full race and 78 miles (126 km) for the "fun run". The Barkley starts any time from midnight to noon on race day, with one hour till race start signaled by blowing a conch. The race officially begins when the race director lights a cigarette. In addition to running, competitors must find between nine and 14 books along the course (the exact number varies each year) and remove the page corresponding to the runner's race number from each book as proof of completion. Competitors get a new race number, and thus a new page requirement, at the start of each lap. The cut-off time for the 100-mile race is 60 hours overall, or an average of 12 hours per loop, and the cut-off for the 60-mile version of the race is 40 hours overall, which averages out to approximately 13 hours and 20 minutes per loop. Once a competitor has started a loop they are not allowed to receive any assistance, other than from fellow runners, until they have finished that loop. Out of more than 1,000 starts, the 100-mile race has been completed within the official 60-hour cut-off 18 times by 15 runners. However, in 2006, nobody finished even the 60-mile "fun run" in under 40 hours. The best women's achievement is Sue Johnston's 66 miles (106 km) in 2001. More than 30 competitors failed to reach the first book (two miles). When a runner drops out of the race, a bugler plays "Taps" upon their return to the start/end point. In 2017, Gary Robbins of North Vancouver, British Columbia, reached the finishing gate a mere six seconds after the 60-hour cut-off, almost becoming the 16th runner ever to complete the Barkley. However, he had taken a wrong turn in the final stages of the race, thus cutting two miles off the course; "The time, in that situation, is meaningless," Cantrell said of the six-second time overage. The full, five-loop race has been completed 18 times by 15 runners as of the 2019 event. ^ Bysouth, Alex (March 30, 2019). "Barkley Marathons: Inspired by a prison break, is this the world's toughest race?". BBC. ^ Jamison, Neal (April 30, 2014). Running Through the Wall: Personal Encounters With the Ultramarathon. Breakaway Books. ^ a b Everett, Matthew (April 13, 2011). "The Barkley Marathons Is the Toughest Race You've Never Heard Of". Metro Pulse. Archived from the original on August 25, 2011. Retrieved March 30, 2012. ^ a b "Race director clarifies final outcome of 2017 Barkley Marathons". Canadian Running Magazine. April 4, 2017. Retrieved August 18, 2017. ^ a b "Ep50 - SPECIAL - John Kelly on finishing Barkley Marathons" (Podcast). The Bad Boy Running Podcast. Retrieved April 15, 2017. ^ Seminara, Dave (March 27, 2013). "The Barkley Marathons: Few Know How to Enter; Fewer Finish". The New York Times. ISSN 0362-4331. Retrieved April 3, 2016. ^ Buteau, Michael (March 30, 2015). "All 40 Runners Fail at 100-Mile Tennessee Mountain Race". Bloomberg.com. Retrieved April 3, 2016. ^ a b Engle, Charlie (May 2011). "Notorious". Runner's World. Retrieved April 3, 2016. ^ Everett, Matthew (April 6, 2016). "A Record-Setting Weekend at the Barkley Marathons, the Race That Eats Its Young". Knoxville Mercury. Retrieved April 6, 2016. ^ Annika Iltis, Timothy James Kane (directors) (2014). The Barkley Marathons: The Race That Eats Its Young. ^ Ethier, David (July 5, 2013). "An Ultramarathon You Can't Finish". Huckberry. Retrieved April 3, 2016. ^ Jhung, Lisa (April 6, 2010). "The Impervious Barkley Marathons". Runner's World. Retrieved April 4, 2012. ^ Dalek, Brian (March 26, 2018). "When the Course Wins: No Finishers at the 2018 Barkley Marathons". Runner's World. Retrieved April 2, 2019. ^ Mcguire, Jane (April 1, 2019). "Nobody finished this year's Barkley Marathons". Runner's World. Retrieved April 2, 2019. The Believer magazine article - "The Immortal Horizon"
"Tales From Out There: The Barkley Marathons, The World's Toughest Trail Race"